The Ken Griffin illusion show toured the world for well over a quarter of a century. The priceless ideas and methods used by the Griffins in their climb to prominence and profit are fully explained. Almost every magician has dreamed, at one time or another, of headlining his own mystery revue. He visualizes the glamorous side of the picture ... the stage flooded with colored and glittering lights, the dazzling scenery, the gorgeous assistants, breathtaking illusions, the music from the orchestra surging to a crescendo, the thunderous cymbal crash as the magician strides on stage for his opening bow to tumultuous applause! This can become reality but what is missing in that dream is the important Know-How living this way of life. The traveling and living out of a suitcase, the advertising, the routining of the show, the packing and the unpacking, theatrical know-how, etc., etc. 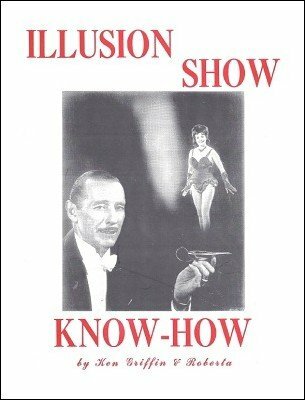 In Illusion Show Know-How , Ken and Roberta Griffin disclose not only their time-tested ways of operating a big show but give you all the information needed to go along with the other aspects of this business. An important part of the ebook deals with presenting stage illusions. Experts agree that fully 80% of the effectiveness of magic depends on its presentation. There are thirty-one detailed line drawings giving exact measurements for building props and scenery, plus seventy-three photographs. You'll learn all the secrets of backstage life plus the know-how that ordinarily takes a lifetime to learn. Here you have all the know-how of the illusion show. This will be one of your favorite ebooks. Even though you may never take out "the big one" you'll be enlightened to its inner workings. Even if you do just a small act you'll still learn much valuable know-how. Several years in preparation, never before has such a complete and authoritative book on touring a big show been published. The profession demanded it. Ken and Roberta Griffin created it and Abbott's have published it and offer it to you for your enlightenment and glorification. Chapter 1: Can Anyone Be A Magician? What Do You Use For Patterns? "Illusion Show Know How" is an extremely valuable real world experience book. The information about living/working on the road, especially when it was written in a pre-internet, pre-celluar world, served me well. The chapter on how to get your mail on the road was worth many times the cost of the book, but not now, since the USPS is no longer one’s lifeline to communication.